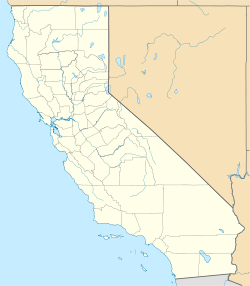 Newberry Springs is an unincorporated community in the western Mojave Desert of Southern California, located at the foot of the Newberry Mountains in San Bernardino County, California, United States. The population at the 2000 census was 2,895. Newberry Springs is located 20 mi (32 km) east of Barstow, approximately 40 mi (64 km) due west of the Mojave National Preserve, and approximately 100 mi (160 km) south of Death Valley National Park. The town is (117 sq mi (300 km2) in area. It is approximately 2,000 ft (610 m) above sea level. The region maintains an average daytime summer temperature of 107 °F (42 °C). In the winter, lows generally get into the 20s, with a dry, cold climate, the immediate area receiving less than 10 in (250 mm) of rain per year. Newberry Springs is a typical desert oasis. Ancient volcanic rock formations, lava beds, sand dunes, mineral springs, and hidden mud baths are found in the area. Interstates 15 and 40 run through the area. BNSF Railway's transcontinental main line and historic Route 66 both run through the town. The original name of Newberry Springs was "Water". Since its earliest days the area in and around Newberry Springs has been a source of water for the surrounding arid region. Camp Cady, located at the western terminus of the Mojave Road just 12 miles north of present-day Newberry Springs, was a resting place and watering hole along the Mojave River for wagon trains coming to California in the 1850s on the old Mormon Trail. In the 1880s the Atlantic and Pacific Railroad hauled tank cars of water from Newberry Springs to the stations and towns in the region, making life in this arid land possible. The climate in Newberry Springs is relatively mild and ideal for many crops, including pistachios, apricots and alfalfa. [citation needed] Newberry Springs has many farms and ranches, which produce ostrich, horse, buffalo, duck, turkey, catfish, and koi. There are also desert courses used for motocross, dune buggy, and ATV racing. The area also supports camping, hunting, fishing, wilderness backpacking, and paraflying. Paraflyte Ranch, a paraflying school, is in the area. Near Newberry Springs is the Calico Ghost Town, the Calico Early Man Site, the Camp Cady wildlife reserve and the Solar One green energy project. Every November, the town is the host of the annual Newberry Springs Pistachio Festival. North of Newberry Springs is the currently vacant site of the former Lake Dolores/Rock-A-Hoola Waterpark. Newberry Springs is home to the St. Anthony Orthodox Coptic Monastery. The Newberry Mountains are home to the nearby Newberry Mountains Wilderness Area. In 1987, the motion picture Bagdad Café was filmed in the area and the truck-stop restaurant featured in the film still exists. The motel in the film has crumbled, but its foundation is still there. The cafe' is now frequented by locals, visitors, but mostly by bus loads of French and German tourists who are fans of the film. Prior to the film the restaurant had a different name. The Bagdad cafe was in nearby Bagdad/Chase Mine area. Gold from the Chase Mine helped establish the bank of the same name, Chase Manhattan. The current restaurant has a rich cast of characters and its own stories and legends. In 2015, Newberry Springs was one of the filming locations for the film Sky as well as Barstow, Bombay Beach, Hinkley, Joshua Tree, Landers, Lenwood, Ludlow, and Victorville, California. ^ "GNIS Detail - Newberry Springs". USGS Geographic Names Information System (GNIS). Retrieved 18 August 2015. ^ "Newberry Mountains Wilderness". United State Department of the Interior Bureau of Land Management. Retrieved December 31, 2013. ^ "Sky (2015) - Filming Locations". IMDb. amazon.com. Retrieved 22 August 2016. Swisher, John M. (1999). The Mojave Desert. Images of America: California. Charleston, SC: Arcadia. ISBN 9780738502199. Houk, Rose (2000). Mojave Desert. American deserts handbook. Tucson, Ariz.: Southwest Parks & Monuments Association. ISBN 9781583690086. Lawlor, Florine (2004). Mojave Desert trails. Bishop, Calif.: Spotted Dog Press. ISBN 9781893343030. Huegel, Tony (2007). California desert byways : 68 of California's best backcountry drives (3rd ed.). Berkeley, Calif.: Wilderness Press. ISBN 9780899974132. Calico Ghost Town; S. California's Greatest Silver Camp. Buena Park, CA: Knott's Berry Farm. Jan 1, 1966. OCLC 191883997. Cook, Bill (Feb 1, 2009). Bill Cook's Ghostly Guide to Calico Ghost Town. Magic Valley Publishers. ISBN 9780982149614. Pearce, Fred (2009). When the rivers run dry : Water, the defining crisis of the twenty-first century. Boston: Beacon Press. ISBN 9780807085738. Smith, Annette; Hill, Trish (2007). The Water Slide. Austin, Texas: Harcourt. OCLC 841578139. Thompson, Luke (2001). Jet ski. Built for speed. New York: Children's Press. ISBN 9780613521031. Wikimedia Commons has media related to Newberry Springs, California.